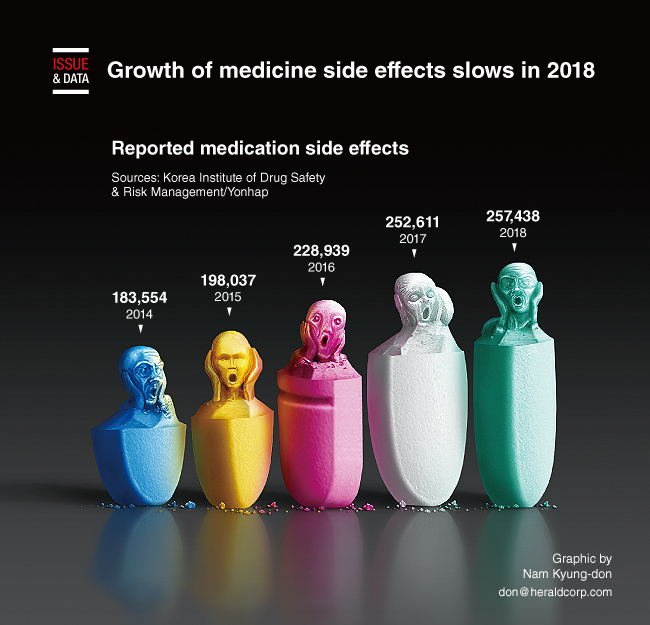 South Korea saw reports of medication side effects gain about 2 percent in 2018, although their rate of growth slowed sharply from the prior year, data showed. Local health authorities handled 257,438 cases of side effects from taking medicine last year, up 1.9 percent from the previous year, according to data from the Korea Institute of Drug Safety & Risk Management. By drug, aspirin, phenacetin and caffeine had the largest reports of side effects with 36,321 cases (14.1 percent), followed by antineoplastics with 27,534 (10.7 percent).